Maya Lin, Vietnam Veterans Memorial, 1981–82. Washington, D.C.
As memorials are objects of public commemoration, we demand a lot of them. They serve as testaments to lives lost, as repositories of grief, and to facilitate processes of mourning. We expect them to do the work of history writing, to draw single comprehensible narratives out of a Gorgon’s nest of individual, often contradictory, experiences. These meanings serve as unifying forces, reinforcing the idea of a shared national identity and healing rifts in the communal experience of nationhood. By endowing memorials with the ability to accomplish these tasks, we bestow them with an extraordinary amount of power and authority. 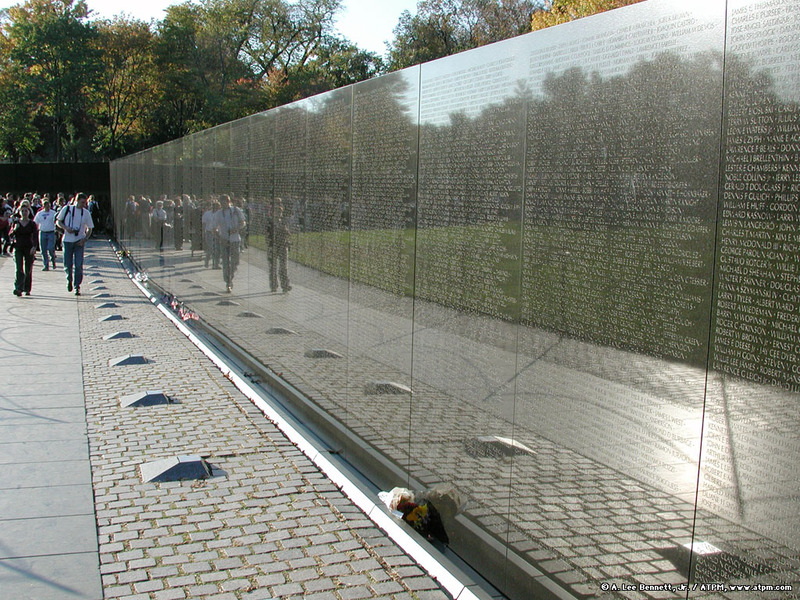 Thus, it is unsurprising that the first skirmish of the culture wars of the 1980s can be traced back to the public debate that broke out in reaction to Maya Lin‘s design for the Vietnam Veterans Memorial in Washington, D.C. Following its dedication, Lin’s memorial quickly became the prototype for American war memorials. Thirty years later, it is difficult to think of her memorial as a controversial work of art. By now, we are so accustomed to its visual rhetoric—the polished black granite, the lists of names, the horizontal positioning—that to think of these components as anything but standard practice takes an act of real imagination. Maya Lin, Vietnam Veterans Memorial, 1981–82. Washington, D.C. Aerial view. However, the years that saw the memorial’s proposal, design, and construction—1980 to 1982—coincided with a momentous shift in the topography of American political culture: the election of Ronald Reagan in 1980 and the ensuing negotiation of a new federal agenda. This development was shaped by the theories of economic neoliberals on the one hand and by the values of their socially conservative allies on the other. Far from being a fait accompli, amassing the public will to support this new agenda took real work. In large part, this was accomplished through a series of conflicts waged at the level of culture. The earliest of these battles was the controversy over Lin’s design. Revisiting the terms of this conflict not only provides insight into how and why visual art came to be so politicized in the 1980s, but also sheds light on the debates of our present historical moment, which, in many ways, parallel the debates of that period regarding the social purpose of art. Both Scruggs’s and the VVMF’s statements clearly conveyed that the memorial the veterans sought was to be an apolitical tabula rasa that would neither contribute to nor comment upon the unresolved controversies surrounding the war. A tabula rasa upon which individuals could project their individual, personal experiences of the war was what the VVMF desired and, as historian Marita Sturken and others have observed, a tabula rasa was what they got. Out of the nearly fifteen hundred entries in the competition, the eight jurors of the selection committee unanimously chose Maya Lin’s design on May 6, 1981. Free of overt historical reference to either the Egyptian or Greco-Roman traditions of monument design—the main visual touchstones for American memorial-building—Lin’s design broke with these traditions through its use of black granite, polished to a reflective smoothness (instead of white limestone or marble); its horizontal orientation, submerged into the earth instead of rising vertically; and its lack of any figurative ornamentation or any embellishment at all, save for the chronological listing of names of soldiers killed in the course of the war, etched into the granite’s mirror-like surface. Frederick Hart. The Three Soldiers, 1982–84. Bronze. Vietnam Veterans Memorial, Washington D.C. Ultimately, the Commission of Fine Arts, which had the final say in the matter, overruled Lin’s objections. Not only was Hart’s statue included at the memorial site, but a flagpole was added as well. Jan Scruggs’s and VVMF members’ desire for a memorial that would heal the social rifts wrought by the war was wishful thinking. Instead, the memorial became a dividing line between factions both real and imagined. On one side were the proponents of Lin’s memorials, defined in the media and the public imagination as Wolfe’s elitist “art mullahs,” “draft dodgers,” the “future New Leftists,” and, of course, followers of Jane Fonda (infamously dubbed “Hanoi Jane” after a trip to North Vietnam, during which she made statements condemning the U.S. military). On the other side were the veterans and their self-appointed spokesmen, politicians such as Webb and James Watt (Secretary of the Interior under Ronald Reagan), and social conservatives such as Pat Buchanan. This alliance between the veterans and their conservative defenders was a new one, forged as a direct result of the cultural battle over the memorial site. For years, American society as a whole, regardless of political affiliation, had studiously ignored Vietnam veterans, their presence a painful reminder of the war’s moral ambiguity. At the time of the memorial’s design, many veterans who had been exposed to Agent Orange, a chemical weapon used by the U.S. military as an herbicide and defoliant, still suffered ongoing health problems. The Veterans Administration hospital system was underfunded and ill-equipped to help Vietnam veterans deal with either their physical ailments or the psychological challenges of post-traumatic stress disorder. In fact, throughout the 1970s, there was little political impetus on any front to address these shortcomings. While many veterans successfully reintegrated into their families and communities, tucking their experiences in combat away on a mental back shelf, others were unable to cope on their own. Lacking sufficient services to assist their recovery, some of these unassimilated veterans turned to alcohol and other drugs, their addictions only sending them further to the margins of society. As Michael Clark points out in the essay, “Remembering Vietnam,” by the late 1960s, Hollywood and the mass media seized on this aspect of the veteran experience, creating variations of a fictionalized veteran “who threatened at every moment to bring the war home with him in the form of flashbacks that turned firecrackers into artillery and passersby into the enemy.”10 In Clark’s analysis, these depictions of veterans served, for nonmilitary American citizens, as a way to “launder the violence of the war by relegating it to some ‘other’ place: Southeast Asia, and the [veteran’s] psychotic unconscious.”11 Such representations enabled film viewers to reframe their experiences of the contemporaneous violence occurring at home, on American soil. Traumatic memories—such as those of police officers brutally beating anti-war protesters at the 1968 Democratic convention in Chicago and members of the National Guard opening fire on students protesting the war at Kent State University in Ohio—were removed, like a tumor, from the body of the nation and assigned to another geographical location: Vietnam. Daniel Libeskind. Memory Foundations (planned design for former site of World Trade Center in lower Manhattan, New York). This message of personal responsibility, in contrast to governance by “an elite group” on behalf of individuals, became a hallmark of the Reagan administration. It set the tone for the ensuing cultural debates pitting “the people” against “the elites,” as found in Tom Wolfe’s criticism of Lin’s memorial design. As conservatives sought to consolidate their gains following Reagan’s election, the Vietnam Veterans Memorial controversy presented an opportunity for conservatives to harness both the affective power of the veterans’ fury and the resulting public outcry on their behalf. 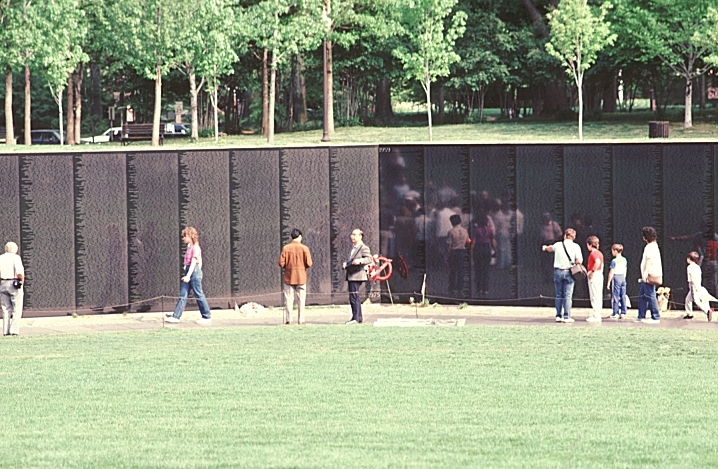 Following a march by thousands of veterans through the streets of Washington, D.C., to the National Mall site, the Vietnam Veterans Memorial was dedicated on November 13, 1982. The controversy surrounding the memorial instantly vanished from the pages of the press, replaced by celebrations of its interactivity, tranquility, and emotive power. Once there was no more room for conflict—the memorial’s form, upon dedication, was no longer negotiable—the front in this culture war moved elsewhere. The shift, however, did not represent a resolved conflict between public art and public memory and memorialization, but merely a temporary relocation of the site of debate. The controversy over the planned 9/11 memorial at the former site of the World Trade Center in lower Manhattan, which began nearly a decade ago, harkened back to the debates of the early 1980s and heralds the current resurgence of cultural warfare. As Sturken notes in her essay, “The Aesthetics of Absence: Rebuilding Ground Zero,” the impetus to create a memorial at the site of the Twin Towers was “almost instantaneous—by the next day, even as the names and number of dead remained unknown, there was discussion of a memorial.”13 Discussions about what to do with the site addressed two twin concerns: the redevelopment of what had been both a hub of commercial activity and an integral part of a broader residential neighborhood—lower Manhattan—and the memorialization of the loss of lives that occurred at the site. The number of parties who claimed direct investment—whether emotional, psychological, or financial—in the site and its future form and use only made the issue more complex and difficult to resolve. The fact that such nongovernmental entities as the New York Times, CNN, and the Max Protetch Gallery took it upon themselves to solicit designs for both the new World Trade Center buildings and for suitable memorials to the attacks indicates the extent to which the American public writ large was attuned to the site’s future. Peter Walker and Michael Arad. Reflecting Absence (planned design for memorial to victims of attacks on the World Trade Center, September 11, 2001). Perhaps Lin’s centrality—twenty years after the construction of the Vietnam Veterans Memorial—to the debate over Arad’s and Walker’s design was inevitable, given her presence on the design competition’s selection committee as well as her legacy as the definitive memorial builder of the late twentieth century. But the fact that the language deployed to critique Arad’s and Walker’s design so closely echoed the criticism launched against Lin in the early 1980s signifies that the debates of that era remain unresolved. Additionally, the emergence of Park51—the proposed Muslim community and cultural center to be located a few blocks from the former World Trade Center site—as a major point of public interest and debate, which peaked during the 2010 congressional elections, confirms the continued political potency and cultural power of memorials as embodiments of representational practice. 1. Karal Ann Marling and Robert Silberman, “The Statue Near the Wall: The Vietnam Veterans Memorial and the Art of Remembering,” Smithsonian Studies in American Art 1, no. 1 (Spring 1987): 10. 2. Daniel Abramson, “Maya Lin and the 1960s: Monuments, Time Lines, and Minimalism,” Critical Inquiry 22, no. 4 (Summer 1996): 685. 4. Marita Sturken, “The Aesthetics of Absence: Rebuilding Ground Zero,” American Ethnologist 31, no. 3 (August 2004): 122. 5. Marling and Silberman, 11. 6. z”The Vietnam Wall Controversy, Round 3, October 1981–January 1982,” History on Trial, Lehigh University Digital Library, accessed April 21, 2011, http://digital.lib.lehigh.edu/trial/vietnam/r3/october/. 8. “The Vietnam Wall Controversy, Round 4, 1982,” History on Trial, Lehigh University Digital Library, accessed April 21, 2011, http://digital.lib.lehigh.edu/trial/vietnam/r4/1982/. 10. Michael Clark, “Remembering Vietnam,” Cultural Critique 3 (Spring 1986): 50. 12. “First Inaugural Address (January 20, 1981), Ronald Wilson Reagan,” Miller Center For Public Affairs, University of Virginia, accessed April 21, 2011, http://millercenter.org/scripps/archive/speeches/detail/3407. 17. Sturken, 322; Anne Swartz, “American Art After September 11: A Consideration of the Twin Towers,” Symploke 14, nos. 1–2 (2006): 95. Editor’s note: This essay was originally published on Art21.org in November 2011.